Dr. Babasaheb Ambedkar Marathwada University (DBAMU) is going to conduct the Centralised Common Entrance Test (CET) for Admission to Post-Graduate Courses (MA, MSc, MCom, LLM) shortly in University Campus and Sub-Campus, Osmanabad and all affiliated Colleges to this University. The BAMU University is going to release the CET admit card on the official website. Online Registration for CET will start very soon. The Candidates, who applied for BAMU PG CET 2019 Examination, those applicants may check and download the admit card from the official website. 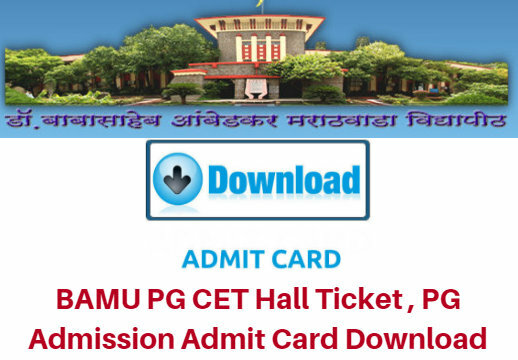 BAMU PG CET Admit Card / Hall Ticket 2019: Dr. Babasaheb Ambedkar Marathwada University (DBAMU) is likely to issue the Admit Card / Hall Ticket for the PG CET (Central and State Level CET) on the website of University for the Academic Year 2019-20. BAMU has released the notification for Admissions to Post-Graduate Courses (Arts, Social Science, Commerce, Science, Fine Arts, Law, Education, Physical Education, and Management) 2019-20 in Babasaheb Ambedkar Marathwada University. Appeared Candidates will be able to download their Admit cards from the official website of the BAMU University. Every year a lot of applicants apply for the PG Course admissions. The BAMU PG CET 2019 Entrance Test will be held quickly. Arts: – M.A. Marathi, Hindi, English, Urdu, Pali & Buddhism, Russian, Sanskrit. Social Sciences:- M.A. History, Political Science, Public Administration, Sociology, Economics, Library and Information Science, Mass Communication and Journalism (M.C.J. ), Music, Geography, “Psychology, Women Studies, Life Long Learn and Extension, Liberal Arts, Archeology, Mahatma Phule and Dr. Ambedkar ThoughtrlYoga, P.G. Dip. in Psychological Counselling (Life Long & Ext. ), P.G. Diploma in Adult Cont. Educational, P.G. Dip. in Psychological Counselling (Psy. Dept.) P.G. Diploma in Women Studies. Fine Arts:- (4 M.F.A. (Regular) (Painting and Applied), (B) M.F.A. (By Research) (Painting and Applied), M.P.A. Commerce: – M.Com., M.I.B., “D.B.M. ManaEement Science:- M.B.A. (Part-Time), Master of Tourism Administration (M.T.A. ), P.G.D.H.A. Mgt., P.G.D.H.C.S.Mgt. M.A. English, M.Sc. Chemistry, M.Sc. Micro-Biology, M.Sc. Micro-Biology, Biotechnology /, Water and Management (M.M.S.). The Admit Card / Hall Ticket can be downloaded from the BAMU official website by clicking on a link download admit card for PG Common Entrance Examination-2019 and entering his/her application number, mobile number, date of birth. The Candidates can also download the admit card by login into ID and password on the website. The candidates must bring the admit card with original identity proof to the examination center for verification. After the completion of Common Entrance Test, the BAMU PG CET 2019 Result shall be declared and updated on the official website of the department. Appeared applicants check and download result for the use of Admit Card and date of birth. The merit list shall be prepared on the basis of CET score and on the basis of marks obtained at qualifying examination, by giving 50% weight-age to each. (b) The Courses which are exempted from CET, Merit list shall be prepared on the basis of marks/score / grade obtained by the candidate in the qualifying examination. Dear Ruchita Pawar, Keep some patience because we will shortly notify you the hall ticket and exam date of BAMU PG at this web page. Dear Shankar, The Hall Tickets for BAMU PG CET Entrance will be displayed on the website shortly. Stay tuned with us for further updates. I am So worried as 2marow and day after 2marow there is a Holiday and Still Hall Tickets are not available on University Portal..